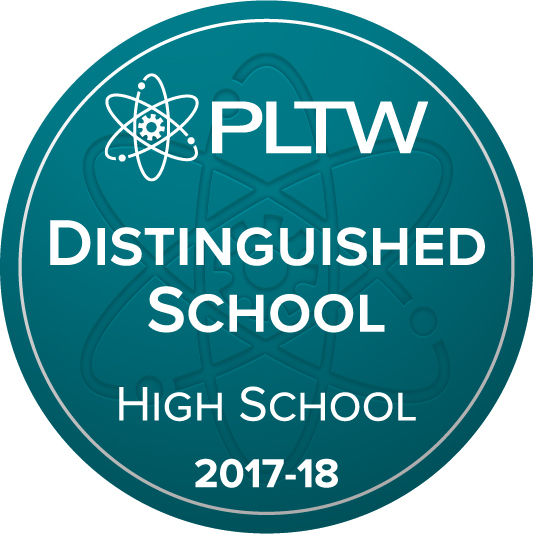 Pattonville High School earned recognition as a national Project Lead The Way (PLTW) Distinguished School for providing broad access to transformative learning opportunities for students through PLTW biomedical science, computer science and engineering courses. Pattonville is one of just 133 high schools across the U.S. to receive this honor. PLTW is a nonprofit organization that serves millions of K-12 students and teachers in over 10,500 schools across the U.S.
Have 70 percent of students or more earn proficient or higher on PLTW end-of-course assessments or 10 percent of students earn the AP + PLTW Student Achievement. Through PLTW programs, students develop STEM (science, technology, engineering and math) knowledge as well as in-demand, transportable skills that they will use both in school and for the rest of their lives, on any career path they take. Pattonville offers PLTW classes in sixth through 12th grades, as well as a fifth-grade, project-based-learning class which draws students from across the district. The computer science interdisciplinary courses engage students in compelling, real-world computer science challenges. As students work together to design solutions, they learn more than just how to code, developing computational thinking and communication skills for the world's increasingly technology-based economy. Biomedical science introduces high school students to medicine and human body systems, as well as the wide array of biomedical science careers. Throughout the program, students take on the same real-world challenges as biomedical science professionals, preparing them for careers in medical and health-related fields. Engineering courses empower high school students to step into the role of an engineer and adopt a problem-solving mindset. Students engage in collaborative, real-life activities like working with a client to design a home, programming electronic devices or robotic arms and exploring algae as a biofuel source. Above and below, students work on a DNA lab in a biomedical science class at Pattonville High School.